The Republican Party is being accused of peddling anti-Irish stereotypes by posting Beto O’Rourke’s mug shot from his drunk driving arrest 20 years ago on its official Twitter account. O'Rourke is of Irish descent. The photo attached to the tweet showed O’Rourke’s 1998 mug shot after he was arrested for driving while intoxicated in Texas. 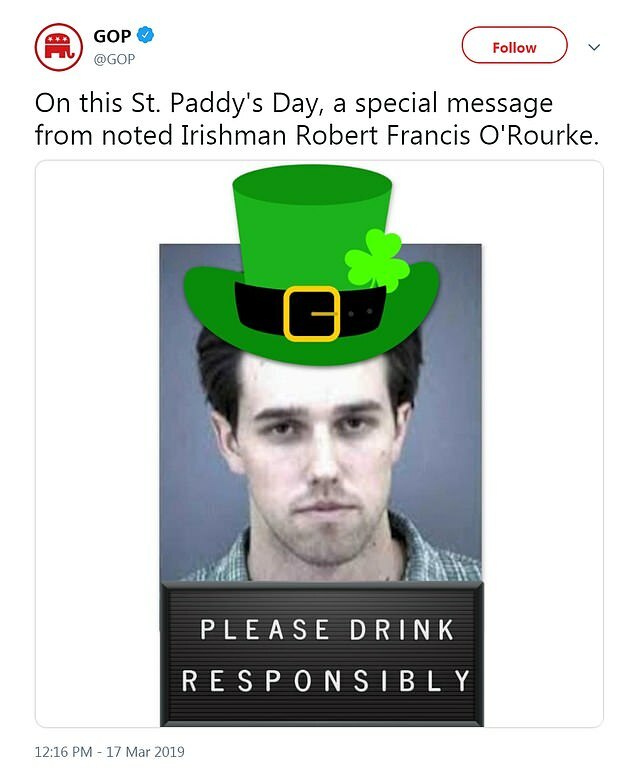 The mugshot was photoshopped, as a green leprechaun hat was placed on top of O’Rourke’s head. The tweet angered many on social media who accused the GOP of promoting racist stereotypes about the Irish. ‘I’m sure Lincoln would be proud of this tweet,’ writer Molly Jong-Fast tweeted. 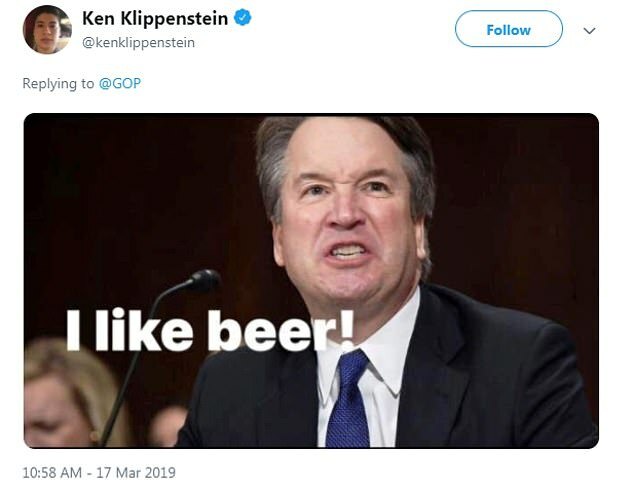 Kavanaugh famously expressed his love for beer during his Senate confirmation hearings, during which it emerged that he had been accused of sexually assaulting a woman at a high school party more than 30 years ago. Kavanaugh, like O’Rourke, is of Irish Catholic descent. In 1976, George W. Bush, who was eventually elected president in 2000, was arrested for drunk driving by police in Maine. Laura Bush, his wife, was 17 years old when she ran a stop sign and struck another car, killing its driver, on a dark country road in Midland, Texas. Gaetz, the congressman from Florida, was arrested in 2008 for driving under the influence, according to the Tampa Bay Times. Donald Trump Jr, the president’s eldest son, was arrested for public drunkenness during a Mardi Gras celebration in New Orleans in 2001. He spent 11 hours in jail, according to PEOPLE. O’Rourke announced this past week that he will seek the Democratic nomination for the presidency. A former congressman from El Paso, O’Rourke became a national figure after mounting a spirited campaign against heavily favored incumbent Senator Ted Cruz. Although Cruz won the election and kept his U.S. Senate seat, the smaller-than-expected margin of victory and the energized grassroots support for O’Rourke had people urging the 46-year-old Democrat to run for president. Now that he is running for president, O’Rourke will likely have to answer questions about his DWI arrest. When he was 26 years old, O’Rourke was driving drunk along an interstate roadway at a ‘high rate of speed’ in a 75mph zone just before 3am. O’Rourke lost control of his Volvo and hit a truck, according to The Washington Post. According to reports, the impact of the crash sent O’Rourke’s car across the center median, where it came to a complete stop. When police arrived, O’Rourke failed a breathalyzer test. His blood alcohol level was measured at .136 and .134 - above the .10 legal limit. He was arrested at the scene and charged with driving while intoxicated, but the charges were later dropped after he completed a court-approved diversion program. O’Rourke has talked about his arrest when running for El Paso City Council, where he served before he was elected to Congress in 2013. ‘I drove drunk and was arrested for a DWI in 1998,’ he said during his campaign last year. O'Rourke announced his presidential ambitions on Thursday and headed for the early caucus state of Iowa, where he had to apologize for a series of gaffes, including his joke that his wife raises their three children practically on her own. He said on Saturday it would be 'very difficult' not to select a woman to be his running mate if he wins the nomination. 'It would be very difficult not to select a woman with so many extraordinary women who are running right now,' he said during a campaign stop in Dubuque, Iowa. There are five women competing against him for the Democratic nomination: Sens. Elizabeth Warren, Kamala Harris, Kirsten Gillibrand and Amy Klobuchar along with Rep. Tulsi Gabbard. Speaking on the podcast Political Party LIVE! in Cedar Rapids, he admitted he was wrong for joking that his wife raised the family only 'sometimes with my help', which had sparked outrage among female politicians and activists. 'Not only will I not say that again, but I'll be more thoughtful going forward in the way that I talk about our marriage, and also the way in which I acknowledge the truth of the criticism that I have enjoyed white privilege,' O'Rourke said. He acknowledged that the 'criticism is right on' and said his controversial statement was his 'ham-handed attempt to highlight the fact that Amy has the lion's share of the burden in our family'. 'She actually works but is the primary parent in our family, especially when I served in Congress, especially when I was on the campaign trail,' he said. He and Amy married in 2005 after meeting on a blind date and have two sons and a daughter tougher. O'Rourke announced his White House bid on Thursday after months of speculation with a three-minute video where his wife Amy sits silently at his side clinging onto his arm. 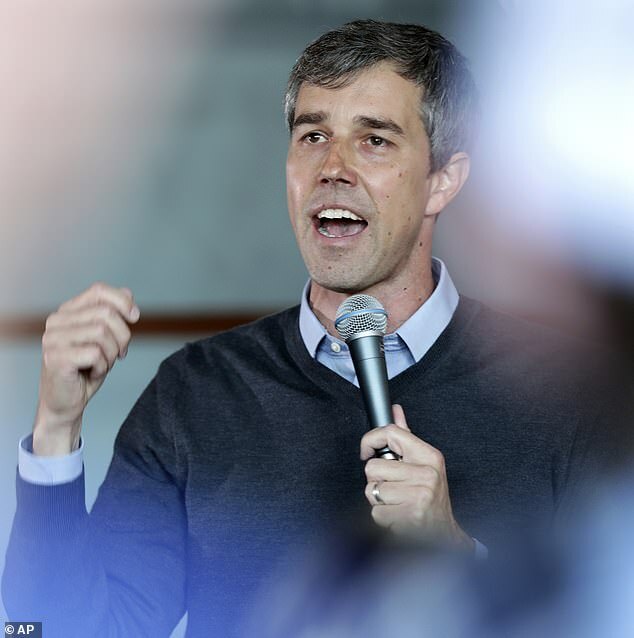 He quickly faced backlash over perceived odd mannerisms, with critics like President Donald Trump mocking him as crazy for his excessive hand gestures and Dr. Drew Pinsky, the host of The Celebrity Rehab, saying 'there's something not right' about O'Rourke. Then O'Rourke went on to apologize for his jarring poetry and fiction written as a teenager while he was a member of a group of activist computer hacking group Cult of the Dead Cow, which included fantasizing about killing young children and a suggestive ode to a cow. The presidential candidate said he was 'mortified' that his teenage musings under the pseudonym 'Psychedelic Warlord' have resurfaced. 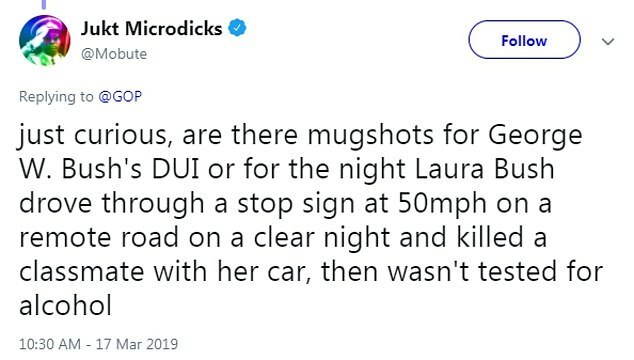 At the age of 15 O'Rourke published a shocking fiction piece about a driver who ran over and killed children with their car because they were 'happy', according to a Reuters report on his hacking history published a day after he announced his White House bid. His writings become even more disturbing in his poetry, particularly one piece fashioned as very suggestive ode to a cow. Lines in the piece entitled The Song of the Cow saying 'Thrust your hooves up my analytic passage, Enjoy my fruits' and 'Buff my balls, Love the Cow'. 'I'm mortified to read it now, incredibly embarrassed, but I have to take ownership of my words. 'Whatever my intention was as a teenager doesn't matter, I have to look long and hard at my actions, at the language I have used, and I have to constantly try to do better,' he added. The liberal El Paso native also talked about white privilege and how he's benefited from it, citing how he walked away from two arrests while he was still a young man without serious consequences. 'I have been arrested twice in my life. Once for attempted criminal trespass and another more braver offense of driving while intoxicated,' he said during the Friday talk. 'Those offenses didn't end up defining me or narrowing my options in life and it's not because I'm a great person... a lot of it has to do with the fact that I'm a white man. 'I've understood better from the experiences of others how this criminal justice system works and how it doesn't work in this country,' he added.